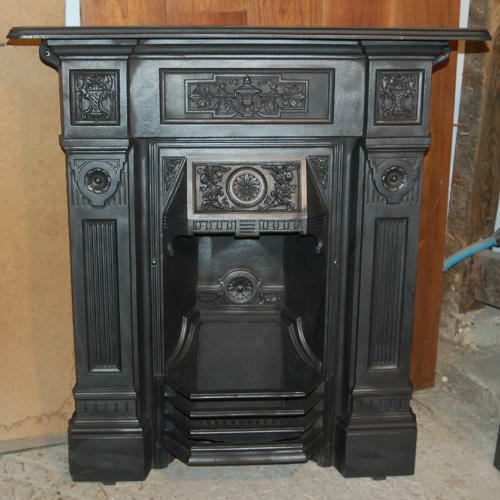 A heavily decorated , Victorian, cast iron combination fire for decorative use. The fire has very pretty designs, with Adam style urns, scrolls and flowers. The fire has a lovely smoke canopy with decorative shape and the concrete back has a pretty flower motif above it. There are linear borders on the legs. The original front bars and smoke flap are present. There is an RD number at the back of the fire, under the mantel, RD199501, dating the fire to 1892. The fire has been blacked and polished, leaving a rich colour and finish. The fire has both fixing lugs present. The fire has had some damage and therfore is suitable for DECORATIVE PURPOSES ONLY. The mantel has had a repair, the new bolts and repair can seen from the back. The grill has been bolted to the fire using new bolts, therefore the fire cannot be used. There are some slight marks and wear, as expected of antique items and the back has surface rust. The fire has been well constructed, with the design of a high quality. The fire would be ideal for a bedroom and its beautiful design would add character and style to a home. A desireable, decorative, antique item.